Maintain maximum efficiency at all times, energy savings of 75% and excellent return on investment. 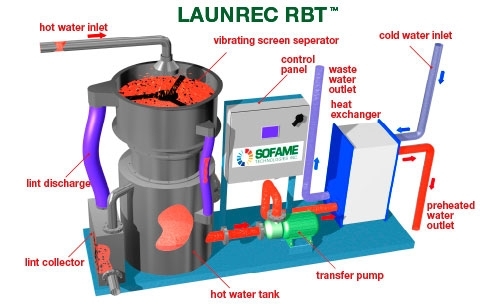 The LAUNREC RBT is a complete heat reclaim system which recovers the energy contained in the waste water of industrial laundries and textile dye houses. The recovered energy is used to preheat a secondary water stream to within 8°F (4.5°C) of the waste water temperature. Self-priming trash (waste water) pump. Vibrating screen separator designed to remove the fibers and lint from process effluents which would otherwise block heat exchanger passages. The resulting screened effluent meets or exceeds local waste water standards. Specially designed plate and frame heat exchanger which is expandable if greater capacity is required in the future. CSA approved control panel, completely pre-wired, including the PLC which permits easy RBT system calibration with respect to process. Automatic heat exchanger plate cleaning system. All wetted components and materials are entirely fabricated of stainless steel. Waste water is drawn from the waste water tank by the trash pump and delivered to the separator. The screened waste water falls, by gravity, through the separator into the feed water tank. The removed fibers and lint are rejected to the lint accumulation basket. The feed water pump then delivers the screened waste water across the plate and frame heat exchanger where heat is transferred from the waste water to a secondary water stream. This pre-heated secondary water is delivered to holding tanks and will ultimately be used in various processes. The LAUNREC RBT system is available for flow rates varying from 25 to 1000 USGPM (6 - 225 m³/h). If your process requires a greater capacity system, please contact SOFAME to determine applicability. ENERGY SAVINGS: "Free" Hot water produced by recovering 75%, or more, of the energy contained in process waste water. System operation fully controlled by PLC to ensure simple and flexible configuration and operation. Automatic cleaning of heat exchanger plates requires no operator intervention. Start-up and after sale service performed by experienced Sofame technicians who are always only a phone call away.